The ability to use a variety of lenses is a huge part of why DSLR video is such a great teaching tool! Basically it comes down to controlling the depth of field or having your subject in sharp focus and everything else out of focus. Here is what I have learned after just a couple months of working with my students and our new DSLR. Any professional will tell you that using manual focus is essential. This can be challenging especially when shooting in HD on a DSLR camera. Here are some tips that should help you. Image Magnification Buttons: Use the navigation buttons to move the little white box onto your subject. Then press the + image magnification button twice to zoom in 10 times. 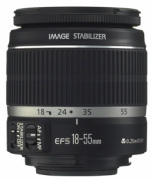 Now when you twist the focus ring you will be able to see the details that will help you to dial in sharp focus. Just press it again and you will return to normal view. Please watch this video demonstration. 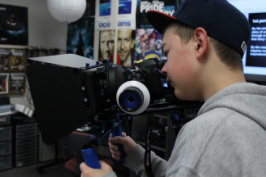 External View Finder: My students love to use our Zacuto Z-Finder external view finder to help focus, especially when outdoors. Peaking: Some external monitors offer a peaking function that highlights areas of the image that are in sharp focus with a colored outline. *Magic Lantern offers this feature inside the T2i. each shot. We are going to set the ISO to auto but I want you to keep track of it so we can see how it changes based on the aperture. Getting sharp focus when shooting HD is critical and can be a real challenge with a DSLR camera especially when you have it set to shoot with a narrow depth of field. When your subject is moving closer or farther away you will need to adjust the focus during the shot. This is called “Pulling focus” and will be much easier if you have a “follow focus” device. Recommendation: FocusShifter $50 - Simple and effective. I am going to buy one for every DSLR Kit I have! 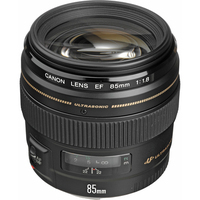 Prime lenses come in one focal length so you can usually get a faster lens (lower f-stop) with better optics for a cheaper price. Since they only have one focal length they also require more planning and setup when you are out in the field because controlling the framing of your shot is done by camera placement, not simply twisting the zoom ring. My students love the images they can get with our prime lenses but they also want that all-purpose kit lens in their bag for when they need to frame up a shot quickly. Prime vs Zoom Lenses – Which are Best? especially in bright sunlight. Some type of eye piece viewfinder is essential. at $400 it is not cheap! 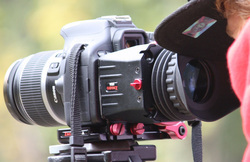 Shoulder Rigs are essential for keeping the DSLR cameras steady when shooting handheld. 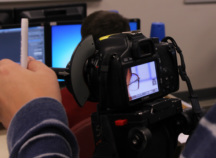 Many of today’s Television dramas and films use this technique to create a more gritty, documentary feel. 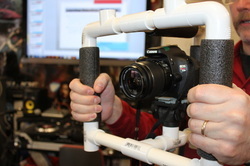 There are tons of ways to save money by building your own camera rigs. Check out just some of these.